To make the salt and pepper seasoning, combine all the ingredients in a mortar and pestle, grind until a fine powder. Remove the heads from the prawns and take out the intestine track. Fill a large wok or pan 1/3 full with olive oil and heat to 170-180 degrees C.
Whisk the egg whites to soft peaks, then add the prawns to the egg. Using your hands, work the whites into all the prawns. Gradually add in the potato starch, until the prawns look dry, shake off any excess flour and cook the prawns, in the hot oil. Using a slotted spoon, remove any small pieces of batter that rise to the surface. Cook the prawns in batches for 2 minutes, or until just cooked. Remove with a slotted spoon and place on kitchen paper to drain. Drain the oil from the pan, reserving 1 tablespoon of oil, Place pan back over a high heat. Add the spring onion, chilli and garlic, toss to combine, then add the prawns, sprinkling over a little of the seasoning as you toss. 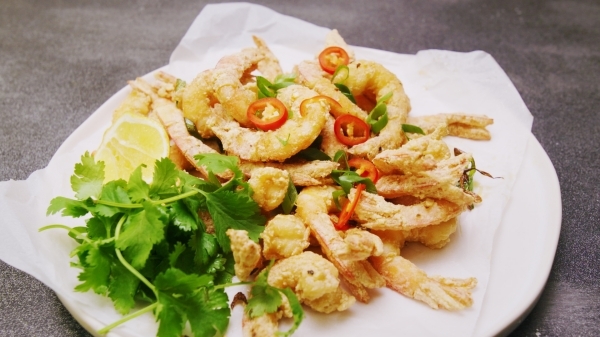 Serve with fresh lemon wedges and coriander leaves. Our friends at Wine Selectors recommend pairing this dish with a Semillon or Verdelho.